What are the main components of Ganoderma? Toxicological studies documented germanium’s rapid absorption and elimination from the body, and its safety. Clinical trials and use in private practices for more than a decade have demonstrated germanium’s efficacy in treating a wide range of serious afflictions, including cancer, arthritis and senile osteoporosis. Germanium antiviral and immunological properties, including the induction of interferon, macrophages, T-suppressor cells and augmentation of natural killer cell activity, suggest its possible efficacy in treating and/or preventing AIDS. 1. Increases Oxygen Absorption – Germanium increases the absorption of oxygen by the blood up to 1.5 times. When inhaled, oxygen from the atmosphere is not all absorbed in the blood as it is limited by many factors. It is important to note that the lack or absence of oxygen in the body will jeopardize the production or metabolism of any nutrients, vitamins or minerals for energy. The last of energy will manifest in weakness and the absence of it will cause death. In 1970, after two decades of research, a Japanese doctor, Dr. Asai, successfully produced water-soluble organic germanium and obtained the international patent rights. How does germanium help in the absorption of oxygen? Every time food is eaten, it is processed and converted into energy, the unprocessed and unconverted food ending up as waste to be eliminated out. The process of food conversion to energy very much depends on the presence of oxygen. The end product of this process is carbon dioxide (CO2) and hydrogen (H). Carbon dioxide is exhaled and thrown off in the atmosphere, whereas hydrogen combines with oxygen to form water (H20), which then is discharged from the body as waste either as urine, sweat or perspiration and stool. Oxygen is one single element needed by any living organism and plants and its absence halts all cellular functions. Correspondingly, the person dies. The germanium present in Ganoderma functions by increasing the absorption of oxygen and saving the inhaled oxygen to unite with hydrogen to form water (H20) which is then eliminated as waste. Germanium takes over the responsibility of binding with hydrogen as it form hydroxyl-germanium, which is eliminated out of the body. This process saves oxygen which the tissues use in the process of cell metabolism and energy production. The germanium content of Ganoderma Lucidum is the highest in all plants studied thus far, making this herb superior to other herbal products. Germanium was observed to increase the body’s immune system. Interferon is one of the substances produced by the normal body cells in response to the presence of viruses in the body. Interferon is known to arrest the damaging effect caused by viruses. Germanium was found to increase interferon level when it is taken in. How? As nutritional food, Ganoderma is believed to provide cells with the right nutrition so they are able to produce sufficient amount of interferon. The germanium content of Ganoderma was found to be the highest when compared with other herbal products like ginseng, garlic, aloe vera or chlorella. This makes Ganoderma a preferred herbal product for use in the suppression of viral infections. 2. Radiation Protector – Experimental studies were done on rats, which were exposed to radiation until the red blood cells and the white blood cells were reduced to 50%. They were then given and injected with germanium solution. Two weeks later the number of red blood cells and white blood cells returned to normal, in spite of the fact that the bone marrow, which produced those elements was also destroyed by radiation (Japanese Radiation Medical Association, Vol 18, No. 11). These studies simply mean that the germanium found in Ganoderma reverses back to normal the cells that may have been compromised as a result of the damaging effect of radiation which is also known to be one of the causes of cancer. This would explain reports of cancer tumors regressing and some completely eradicated as a result of taking Ganoderma Lucidum. (Ganoderma Protects – Hydroxyl Radical and UV Irradiation by Department of Radiation Biology, Environmental Radiation Research Group, Korea . Atomic Energy research Institute, Yousong, Taejon 305-600, Korea by Kim KC, Kim IG). 3. Pain Relieving Properties – Germanium has the property of relieving pain because of the presence of a substance known as “endorphin”, a morphine-like chemical that acts the way morphine does in relieving pain. Morphine is a very potent pain reliever produced by modern science. 4. Blood Pressure Regulator – Ganoderma Lucidum has been observed to reduce blood pressure by two mechanisms. First, in the central nervous system – it has an inhibitory effect on the sympathetic nerves. Our body is governed by automatic nerves that regulate the speed of the heartbeat as well as its contracting ability. They also act on the blood vessels by constriction of the blood vessel wall (reducing the opening of the blood vessel limiting the easy flow of blood). The sympathetic nerves also call the “autonomic nerves” respond to the changes in the oxygen need of the body’s vital organs such as the brain, heart, lungs, etc. When there is lack of oxygen in these vital organs, the sympathetic nerves are stimulated to increase the heart rate to compensate for the diminished oxygen supply and constrict the blood vessels to limit the flow of blood to other parts of the body, giving priority to the vital organs. This action correspondingly increases the blood pressure. Blocking the sympathetic stimulation is what Ganoderma does to the body’s circulatory system. Ganoderma is reported to inhibit the autonomic nervous system (particularly the sympathetic nervous system) to exert its speeding up property on the heart by slowing the heart rate thereby, decreasing the systolic blood pressure and inhibiting its constricting action on the peripheral blood vessels to reduce the diastolic blood pressure. Ganoderma second action in reducing blood pressure is via the kidneys. The kidneys are organs in the body that help regulate the flow of blood as well as the blood pressure which automatically responds to changes in the volume of blood that passes through them. Where the flow of blood is diminished, the kidneys respond by releasing an enzyme known as rennin. This then is acted upon by a substance coming from the liver known as angiotensinogen. The combination of these two substances forms a substance called angiotensin 1. This substance is acted further by an enzyme coming from the lungs and other tissues known as “angiotensin converting enzyme” or ACE to produce angiotensin11, a very powerful blood vessel constrictor which raises blood pressure. The ganoderic triterpenes from the fruit body of Ganoderma was reported to block the angiotensin converting enzyme or ACE to act in the conversion from angiotensin 1 to angiotensin 11. this way, no rise in blood pressure takes place. 5. Diuretic Properties – Ganoderma has a diuretic effect when taken in, although the exact mechanism has not been known. So, those taking the supplement must increase their fluid intake. The diuretic effect of Ganoderma is believed to help reduce blood pressure. Ganoderma as reported is not only capable of lowering blood pressure but it also raises blood to normal level. It is believed that Ganoderma being a food supplement, has over 200 elements and it is further believed to have more elements yet to be discovered. This maybe the reason for its balancing capability as body cells receive this almost perfect food (Department of Pharmacology, Oral Roberts University School of Medicine, Tulsa, OK 74127). 6. Lymphocyte Proliferating Properties – Alpha-D Glucan from spores of Ganoderma Lucidum has a potent stimulating effect for lymphocyte proliferation and antibody production (Report from the Shanghai Institute of Materia Medica, Shanghali Istitues for Biological Sciences, Chinese Academy of Science by Bao X, Duan J. Fang X, Fang). The importance of lymphocytes cannot be overemphasized. It is the one responsible in preventing viruses from causing damage to the body and it also plays a major role in the immune system. Lymphocytes are cells in the body assigned to detect the entrance of different viruses harmful to the body. It is the body’s most trusted protector. The absence of lymphocytes will jeopardize the body’s defense system against viruses and man becomes vulnerable to serious consequences, even death. Due to the fact that until today there is no available medication to kill these viruses, Ganoderma was observed to increase the number of lymphocytes circulating in the blood through proper balance of food. Ganoderma was also observed to provide food to the cells that make up the lymph nodes, spleen and the thymus glands which are responsible for the production of lymphocytes. Therefore, Ganoderma when taken as food protects the body from damaging effect of viral infection. 7. Polysaccharides – are carbohydrates made up of many simple sugars. One of the polysaccharides found in Ganoderma is the Beta-D-Glucan. a. Beta-D-Glucan – is the substance found in Ganoderma known to possess a high anti-tumor activity. In one study, laboratory researchers trying out various substances on prostate cancer cells found that applying Ganoderma extracts resulted in self-destruction of undesirable cancer cells. In another study, they tried the extract on laboratory animals with liver cancer growth and the cancer was reduced by up to 90 percent (Ann NY of Science). In China, research has demonstrated the reduction of tumor and alleviation of the effects of leukemia (Alter Comp Ther 12/98). Polysaccharides from Ganoderma offer hope for cancer patients and sufferers of many devastating diseases. The presence of these polysaccharides had increased antibody count which strengthens immunity. Antibodies are substances produced by normal body cells to destroy foreign invaders or to neutralize poison that may cause damage to the body. The polysaccharides found in Ganoderma Lucidum enhances the proliferation of “T” and “B” lymphocytes thereby stimulating an immune activity. T&B lymphocytes are specialized body protectors to any invading organisms, particularly viruses which cause the proliferation of abnormal cells labeled as cancer. Using Ganoderma on cancer patients has resulted in the regression of tumor and prevented the spread of tumor cells to other organs (mestastasis). Ganoderma’s capabilities make it an ideal food supplement to protect against cancer and other malignancies. b. Anti-Cancer activity – The active ingredients responsible for the prevention and suppression of cancer spread are the polysaccharides and germanium content of Ganoderma. According to a study made by Prof. Ta Cheng at the Medical College of National Taiwan University; Prof. Cheng Hui-hua and Prof. Tung Ui-chi of Taipei Medical College, these two components, when taken separately, have no effect against cancer. But when taken in combination, there was a marked regression and even disappearance of the cancer cells. The presence of these two compounds are thus important to get the desired effect. Fortunately, these two elements are present in Ganoderma Lucidum. Studies have shown also that there are more than 50 anti-cancer properties that have been isolated from the fruit body and the mycelium of Ganoderma which makes it an ideal food to prevent abnormal cell proliferation and spread. These findings brought into view after over a decade of studies, support the fundamental principle that oriental medicine embraces, that these fungi help to regulate the body’s homeostasis and bring the diseased person back to his or her normal state. 8. T-Cell Activator – Ling Zhi-8 – A study done in the immunology Department, Genentech, Inc. South San Francisco, California by Haak-Frendscho M. Kino K, Sone T, found that the protein part of Ganoderma which is Ling Zhi 8, possessed a potent mitogenic effect on human peripheral blood lymphocytes. They concluded that Ling Zhi 8, possessed a potent mitogenic effect on human peripheral blood lymphocytes. They concluded that Ling Zhi-8 is a potent T cell activator. Ling Zhi 8, the protein portion of Ganoderma Lucidum was studied in Germany at the Institut fur Molekularbiologie und Biochemie, Freie Universitat, Berlin, Germany. Ganoderma Lucidum possesses properties that stimulate B cells production three to four times as compared with other substances known to stimulate the immune system. B cells are specialized cells responsible for hormonal immunity. These are cells which produce antibodies. B cells act like sentinels and detect invaders including their identity. Then they are tagged and presented to the macrophage for destruction (macrophages are cells responsible to kill the invaders). The protein component of GL (Ling Zhi 8) has 110 amino acid residues as studied at the Biochemical Genetics Division, Meiji Institute of Health Science, Kanagawa, Japan. These amino acid findings show the many different contributions they have to normalize body functions. 9. As Antioxidant – Super oxide dismutase or SOD is an antioxidant produced by the body to neutralize the effect of free radicals (poisonous substances released by the body from waste product as a result of chemicals ingested, various infections, drugs and stress). Free radicals when present in the body, need to be neutralized. Otherwise, the normal cells will undergo pathological changes causing the cells to malfunction or to be transformed into abnormal cells known as cancer. Ganoderma was found to increase the level of superoxide dismutase produced by the body’s normal cells thereby, providing enough superoxide dismutase or SOD to neutralize the free radicals and prevent the development of abnormal cells. There are other products available that are known antioxidants such as Vitamins A, C,E, selenium, lycopene and beta-carotene. However, the most powerful antioxidant is the enzyme SOD produced by our own body cells. Taking Ganoderma regularly acts as neutralizer of “free radicals.” It can well be said that when taken regularly, Ganoderma may prevent the formation of cancer. Ganoderma Lucidum triterpene possesses the highest antioxidant properties from the study done in Department of Pharmacy, The Chinese University of Hongkong, Shatin, N.T. Hongkong, China by Ahu M. Chang Q, Wong L.K. Chong FS, Li RC). 10. Antifibrotic – Research in Korea from College of Pharmacy, Medicinal Resources Research Center, Wonkwang University, Iksan, Geopnbuk, Korea by Park EJ, Ko G, Kim J, Sohn DH. They found that the polysaccharides from Ganoderma Lucidum reduced the serum aspartate transaminase (AST). The polysaccharides found in Ganoderma show its antifibrotic properties as it lowers the collagen formation and their deposition in the liver. Once the liver cells are damaged or injured, the body’s response is to repair the damaged part by replacing it with fibrosis. The formation of fibrosis is brought about by the presence of collagen, making the liver hard and non-functional. The reduction in the collagen formation would therefore prevent the formation of fibrosis and prevent liver cirrhosis. Delaying the formation of fibrosis in the liver certainly makes Ganoderma a liver protector. Beta-glucoronidase is an enzyme known to cause damage to the liver. Inhibiting it will prevent liver damage and Ganoderma Lucidum was found to prevent the beta-glucoronidase from damaging the liver. Superoxide is also known to induce liver and kidney damages. It was studied that Ganoderma Lucidum extract is responsible for scavenging or removing the superoxide and also removing the free radical, protecting the liver from injury, and thereby preventing irreversible liver cell damage. 11. Germanium – known to prevent osteoporosis – From the Department of Pharmacology, Nihon University School of Dentistry, Chiba, Japan by Fujii A. Kuboyama N, Yamane J, Nakao S, Furukawa Y. They studied the effect of germanium on rats fed with low calcium and decreased the level of calcitonin to cause osteoporosis. They found out that those rats with germanium prevented the decrease in bone strength and affected the femur cortical bone index and bone mineral mass caused by osteoporosis. 12. Antileukemia – Leukemic patients were given with a high dose of Ganoderma Lucidem (6 caps 3x a day) for three months prior to chemotherapy and continued for a period of three month. Patients were given cytarabine and daunorubicin. All patients had visible response when Ganoderma Lucidum was added to their regimen changes in their white blood cells (WBC); hemoglobin and platelet counts were either significant or very significant after three months of treatment. According to researches, the long term prognosis seems encouraging. Ganoderma brings hope even to leukemic patients. 13. Effect of Ganoderma on Cancer of the nasopharynx – Five patients with stage III cancer of the nasopharynx (cancer in the nose area and to the throat) were given six capsules of Ganoderma Lucidum three times a day for one week before chemotherapy and radiation and continued for three months. Patients were given a complete course of radiation for six weeks and chemotherapy regimen consisting of cyclophosphamide, lomustine, daunorubicin and vincristine once a month for four months. Observable response was noted in all the patients and a significant reduction and shrinkage of the tumor size was seen after 40 days of treatment with Ganoderma Lucidum in concurrence with radiotherapy and chemotherapy. A complete regression of the tumors was achieved after 90 days of treatment. The regression was not the direct effect of Ganoderma Lucidum but was due to its immunopotentiating effect on the different immunologic cells responsible to accelerate the production of interlukins-2 from helper T cells that potentiate the induction of anti-tumor cells, such as NK or Natural Killer cells, cytotoxic macrophages, in addition to the induction of interferon production. Patient was energized with good appetite and sleep and pain was alleviated. No side effect was observed. 14. Triterpenes – are simple lipids present in Ganoderma and is responsible for its bitter taste. There are around 200 fatty acids found in Ganoderma and carry with them therapeutic properties. High level of bad cholesterol LDL is one of the major risk factors to heart disease. Accumulation of these substances in the walls of the blood vessels form a “plague” making the blood vessels nonpliable, hard and narrow. As blood passes through the narrowed blood vessels lumen, two things can happen. First, the diastolic blood pressure will rise. Second, there will be diminished blood flow to the organs that are to be supplied. This event will result in the starvation of the cells of nutrients and oxygen and if left uncorrected will cause cell destruction and death. Taking Ganoderma reduces the blood cholesterol level thereby, preventing the development of atherosclerosis and reducing the risk of heart attacks. There were 20 types of mushrooms studied and Ganoderma Lucidum was found to possess pronounced anti-cholesterol properties (Studies made by Russian scientist Li Khva Ren, Vasil’ev AV, Orekhov AN, Tertopv VV, Tutl’ian VA. Against Autoimmune Disease). 15. Adenosine – is a nucleotide important in the production of energy. It is responsible for giving power to the cells so they can produce the needed substances necessary to sustain life. Many of the food we eat must be converted first into adenosine before they can be utilized for energy production. Ganoderma has adenosine ready for cell utilization. The adenosine present in Ganoderma apparently explains why people taking Ganoderma feel energized with claims of raised energy level. Studies had shown that taking Ganoderma: Decreases cholesterol level including free fats. Lowers the blood lipid level and stabilizes cell membrane. Prevents platelet agglutination and enhances thrombolysis thereby preventing the thrombosis. Improves the functions of the cortex of the adrenal glands to help maintain endocrine balance. Regulates the metabolism for a youthful feeling. Balances blood pH and possesses the property of a vasolilator so there is an increased blood flow to areas where blood is needed. 17. Anti-Platelet Aggregation – Ganoderma Lucidum was given to 15 healthy volunteers and 33 patients with artherosclerosis. Platelet aggregation was inhibited by Ganoderma Lucidum. Platelets by nature repair any rough edges along the blood vessel walls. Unfortunately, the aggregation makes the area more rough which in the long run will clog the passage of blood and cause stroke if it occurs in the brain or heart attack if it occurs in the heart. Ganoderma prevents the aggregation and accumulation of platelets. Its action is similar to aspirin. Its advantage however, is in its being natural with no known side effects. 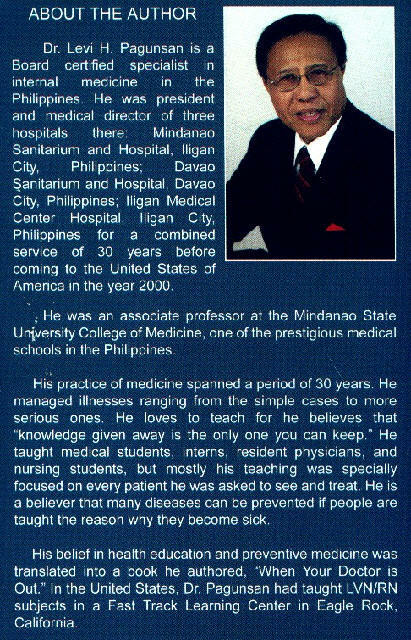 By: Levi H. Pagunsan, M.D., F.P.C.P.